Red wrote: Amazed to hear surprise expressed by one of the politicians in Florida. At the risk of sounding like someone lacking in compassion, it's hard to feel sympathy for a nation whose people are largely invested in the notion of the right to bear arms. I think you mean 'bare arms'. In this case (and many others, of which Columbine and Sandy Hook are just the two easiest to recall) most of the victims were too young to vote so compassion is not compromised. But yes, this is a bloodbath absolutely of the US's own making. Why would they want the right to bare arms? To show off their tattoos! It's not the guns though. OK, if it's not the guns, it must be Americans - they're farkwits. I've said it before - the only "luck" (I don't believe in the commodity) I have experienced in my life was being born an Aussie. The Yanks can have their gun-addled cesspit of a country. Absolutely tragic, the parents' lives will never be the same or as happy as they should have been. Life's hard enough already without this sort of thing. I have friends in America who are very pro-gun and do not agree with me, but my stance is this. The UK gun deaths per 1,000 people is very low, thankfully. Every death is one too many but it's low. Would making guns legal for just about anyone in UK reduce gun deaths here? No is the answer. The USA has 10 times the gun deaths per 1,000 people that we have and guns are legal in most states there. Gun deaths would increase dramatically, if not inline with USA figures, but be severely up. If the USA got rid of guns and made the punishment for carrying one severe enough, yes we would still get shootings but gun deaths would fall dramatically. Of that i am certain. One problem with guns is that formerly sensible people who owned and used them correctly became depressed, some became revengeful, others got either senile, disturbed or crazy. There's little time for escape with a gun, even if you own one. He who shoots first wins. The argument i often hear is that if people didn't have guns they'd hire a van and carry out islamic-style drive-over killings. Or they'd use a knife. Well the former takes far more arranging, it's far harder to carry out than pulling a trigger and as for knives you still have a far harder job killing 20 kids with a knife than with a gun which can release bullets as fast as you can blink. There is no easy answer to this but i feel the only possible route is to get rid of guns in public which of course is hugely controversial. But no guns equal no gun deaths and even getting rid of 90% of them would surely be better for society, overall. In time it will happen. If you can get prosecuted for patting a female colleague on the bum 40 years ago i am sure we can agree that having a gun in the high street isn't acceptable. I totally disagree however with some comments about the USA being a slum. Yes some of it is, like many UK and even Australian towns are now. I only know too well how many shyte holes my country has. But places like Utah and Wyoming (forget the Hollywood freaks and the NYC sprawl) are absolutely fabulous, with scenery, empty roads and wildlife as good as anything on the planet. Our friends live in Moab, Utah and it's fabulous. Just like northern California, upper New York state and many parts of the unspoiled deep south. My work takes me to USA around 10 times a year and we holiday there as much as we can. It's a fantastic country and the company i work for does very well there. Other than the long haul flights which i hate i look forward to the next visit as soon as the current one ends, to be honest. America is huge and you just need to find the bit that floats your boat. it will be there somewhere. Are you being serious? I do know my bear from my bare. That joint is insane. Strumpet wants to tool up teachers. Sweet Baby Jesus, what a pack of qunts. The ultimate irony would be a loony bursting in on an NRA meeting and shooting everyone before they could get their Glocks out in response. Strumpet is the NRA equivalent internationally. Threatening all and sundry. We live in strange times. Thank fark I'm not a Seppo. If they're collectively as stupid as their insistence on a right to bear unnecessarily potent arms suggests, they deserve everything that comes with that. I feel very sorry for the innocents condemned to live (and die) with them. Sorry for late reply - it matter not a sod what you or I or those smartarses at the Concise Oxford with all their goddam booklernin' think, if a million semi-literate rednecks on the SBM say it's 'bare arms' then 'bare arms' it is - spesh seeing as they'll all have guns, or as our old mate Spindoctor would say, 'f#$%ing guns'. 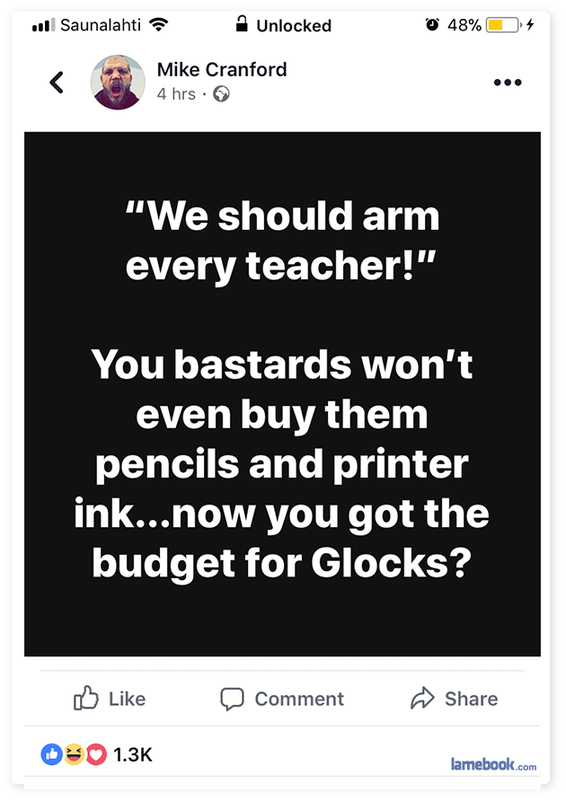 And you can understand US teachers saying "fark off, we already have enough responsibilities for these kids without having to shoot psychos dead on their behalf". had begun working with veterans after leaving the military. Routh's mother, who worked at the school that Kyle's children attended, had heard of his work and asked him to help her son. He agreed to take Routh to a shooting range, which Kyle believed had therapeutic value. On February 2, 2013, Kyle and his friend, Chad Littlefield, 35, were shot and killed by Eddie Ray Routh at the Rough Creek Ranch-Lodge-Resort shooting range in Erath County, Texas. Both Kyle and Littlefield were armed with .45-caliber M1911-style pistols when they were killed, but neither gun had been unholstered or fired, and the safety catches were still on. Kyle was killed with a .45-caliber pistol, while Littlefield was shot with a 9mm SIG Sauer P226 Mk.25 Mod 0 pistol. Both guns belonged to Kyle. Lol. Potarse says he would have tackled the school shooter, even unarmed. horace wrote: Lol. Potarse says he would have tackled the school shooter, even unarmed. skully wrote: A fair call. The school had a paid armed security guard who (understandably) froze. Why do we think that a teacher would have the stones to pull a trigger and kill someone, even in self defence.